Status: Alive. Possibly paired with Evie (2012 female) or Cotton (2013 female). No breeding attempts yet. 2016: Made 2 nesting attempts, both failed. 2017: Made 1 nesting attempt - abandoned early in incubation: 2018: Made 3 nesting attempts - all failed at egg stage. 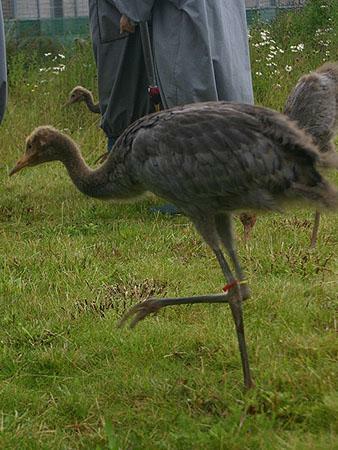 September 2012: Phelps was an aggressive bird at crane school, who liked to be the dominant member of the group. 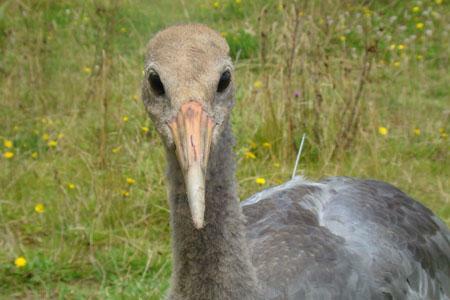 He became the second in line, and remained dominant during his time at Slimbridge. He loved the water channel and spent a lot of time resting. 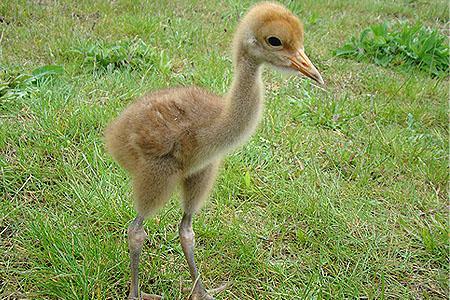 He is the oldest bird of the 2012 cohort, and has a tendency to let the other, smaller cranes know! Once transferred to the new aviary environment in Somerset however, these scuffles became fewer and further between as he matured and settled down. Once released, Phelps has become a bit of a 'loner' and although he has been roosting in with the main group, spends much of his time alone during the day. October 2012: Phelps was seen with his backpack partly shed and tangled around his leg in early October, and was caught by costumed aviculturalists, his back back was removed, and he was released. We still don’t fully understand how he managed to get in such a tangle. This has not happened with any of the other birds. January 2013: As autumn turned into winter, the cranes began to flock together to look for food, which they found in plentiful supply in the form of maize left in fields from the harvest. All 48 have been spending most of their time either feeding in the maize stubble on Stan Moor, completely unperturbed by the surrounding floodwater. March 2013: In early March – Phelps was seen to have some fishing line tangled around his beak. Plans and attempts were made to recapture Phelps to remove the line, but none were successful. 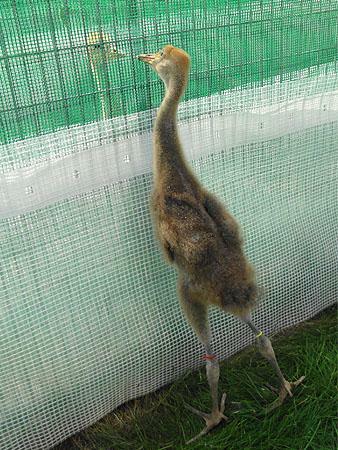 His condition seemed to worsen, as he could not preen or feed properly. However, by 15th March the line had fallen off and soon Phelpe was back to normal. January 2014: Apart from the fishing line incident in the spring, 2013 was a largely uneventful and peaceful year for Phelps, spending the spring and summer on Aller moor and West Sedgemoor, the autumn feeding in and around the Stoke St. Gregory Ridge and Stanmoor and the winter flood period on Stanmoor pasture, pulling up worms as part of a large flock. July 2015: Phelps remained on the Somerset Levels and Moors though to early spring 2014 but in April he turned up at Slimbridge for 22 days before flying back to spend the spring and summer, autumn and winter in Somerset. In early March 2015 he turned up at Slimbridge in the company of Evie and Cotton – either of which he may be forming a bond with – yet to be confirmed! He has gone off the radar for the last couple of months though and we await a sighting. 2015 is the summer that Phelps is due to moult however, so it is possible that he is moulting somewhere and will turn up soon. Perhaps he is one of the small handful of birds that have been seen creeping in the tall hay meadows of West Sedgemoor, waiting for his flight feathers to re-grow. February 2016: Phelps turned up on West Sedgemoor in August - and remained in Somerset through the autumn and winter of 2015/16. He does not (yet) appear to be paired with any particular bird. July 16: Remained at Slimbridge and seen as a pair with Elizabeth in February. 1 st incubation started sometime in April but failed on 7/8 May, cause unknown. 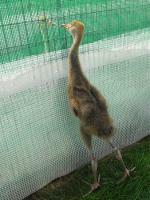 2 nd incubation started on 19 th May in the 100acre area but was abandoned after 24 days. No further attempts were made. Later in May he was observed with Cookie near Muchelney in Somerset. Nov 17: Phelps paired with Elizabeth at WWT Slimbridge in late February. They were still together on 20th March but not settled anywhere in particular. It was reported that this pair had prepared but then abandoned a nest. They were back feeding with the flock soon after. They were still together at end of June but no further attempts at nesting were observed. Both birds have been seen in Somerset and Slimbridge since then. Sept18: Phelps paired with Elizabeth and remained at Slimbridge but observed in Somerset in late March with Elizabeth. They made one nesting attempt in early April which failed after a short period. The second attempt started on 30th April and failed again after about 16 days. A third and final attempt started on 7th June and again failed at an early stage. In late August they were back with the Slimbridge flock.